MTVW traditionally provides little detail within its RNS statements, which is not great. However, I can live with the sparse updates given the group’s illustrious long-term record — the dividend has grown at a 13.5% average during the last 25 years! The forthcoming annual report will contain much more information, so until that’s published my current verdict involves a fair bit of guesswork. When the annual report is released, I’ll post a comment to this Blog post that evaluates the extra information. You would not know it from the sparse management commentary, but these results were actually a record for the residential-property investing firm. Revenue, gross profits and operating profit (before changes in the fair value of investment properties) were all ahead of the group’s previous peaks set during 2007. Indeed, it is probably worth mentioning that since 2007 and the top of the property market, MTVW’s net asset value has still managed to advance 66% and the dividend has improved by 83%. * H1 better than H2…but did the end of the year finish weak? In fact, a statement in February said gross profits had improved by 41% during the first 10 months of the year, which compares to the 21% advance for the full year. The implication here is that gross profits for the final two months of the year were very weak. I am not too concerned about a possible weak Q4. The nature of MTVW’s properties means they become available for sale at any time (usually when the sitting tenant leaves or dies) and revenue from month to month can therefore be unpredictable. What’s more important to me is the gross margin — that is, the gain MTVW makes from selling its properties over their original cost. So I am pleased the overall gross margin throughout last year was 65% — the highest for seven years. At £60m, net debt is the lowest since 2007. Lifting the annual dividend by 37.5% showed some confidence, too. But there was no mention of succession planning this time. Mr Sinclair will turn 68 later this year and the word on the grapevine (at least from last year’s AGM) is that Mr Sinclair is in no hurry to relinquish his executive duties. MTVW’s preceding interim figures revealed the group’s trading properties had a current market value of £666m versus a book value of £318m. As expected, there was no further update to the current market value other than to say the figure was “way beyond” the historical-cost number. These results showed trading investments of £323m which, if sold at the the average margin enjoyed during the last ten years, would yield about £840m. Taxing the resultant gain at 20% and then adding on MTVW’s other investments of £29m and subtracting its debt of £61m, I arrive at a possible net asset value (NAV) of £705m or £180 a share. 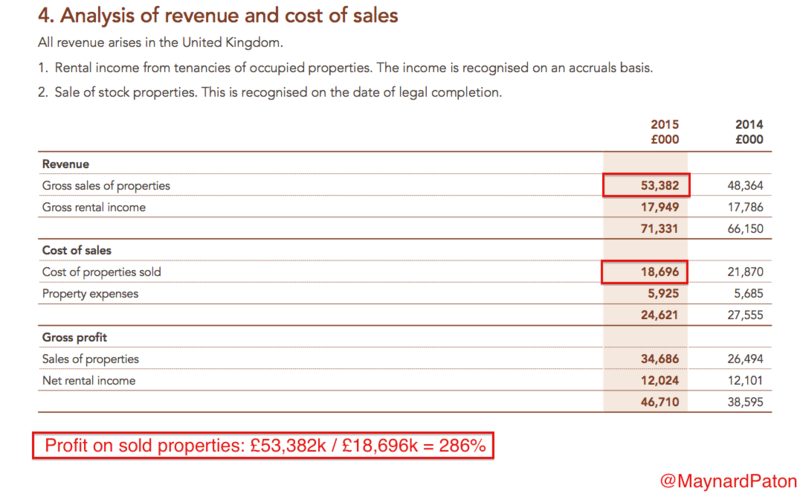 Using the £666m market-valuation figure presented within November’s interim results, and then assuming a 33% uplift for converting the properties from sitting tenancies to normal properties… I arrive at an £888m valuation. Then taxing that gain at 20%, adding on the other investments of £29m and subtracting debt of £61m, I arrive at a potential NAV of £743m or £190 per share. With the share price at £120, clearly there is still some upside potential in place here. But the big unknown is just how long it will take MTVW to sell its existing properties to realise my potential £180-plus per share NAV. All told, it was far easier to judge MTVW back in 2011, when I bought at about £41 and when the NAV — based on historical cost! — was £55 per share. Meanwhile, the lifted 275p per share dividend supports a 2.3% income. * Next update — a Q1 update on 19 August. I mentioned in the initial Blog post above that chief exec Duncan Sinclair was in no hurry to relinquish his executive duties. The 2015 annual report provides further evidence of that being the case. “Our management teams continue to evolve and it may become appropriate to appoint one or more of these personnel to the Board. The continuing good results and the sound financial structure of the Company are a testimony to tried and trusted methods and tried and trusted personnel. Whilst we are aware of the need for our management structure to evolve for the future benefit of the Company, our results do not suggest that radical surgery is needed as a matter of urgency. That reads to me as if Mr Sinclair is staying put as chief exec for some time. “Looking ahead, we believe that we will identify similar opportunities in the coming months. Our strength is based on a tight focus on our core business of regulated tenancies together with a prudent approach. We have kept gearing low and borrowing under control. If the results for 2016 show the same sort of progress as the figures for 2014 and 2015 did, then I will be happy. 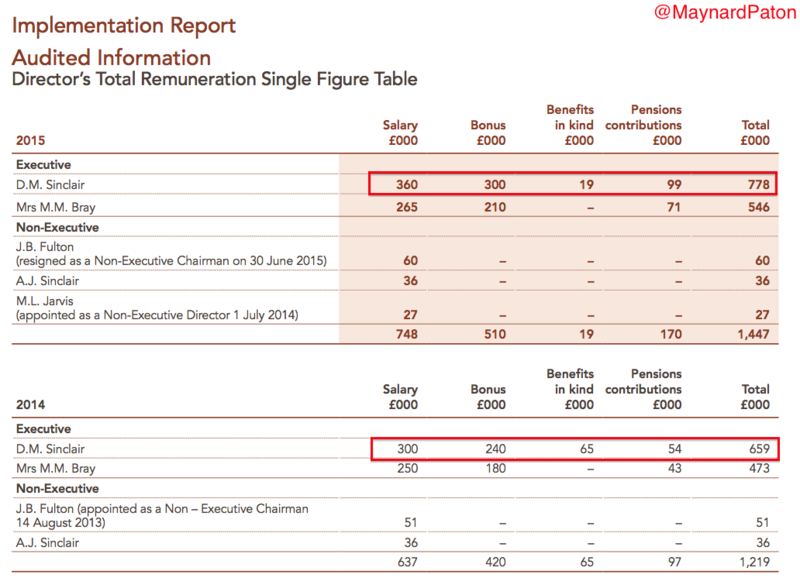 True, the 20% pay rise looks generous, but my records show Mr Sinclair’s salary has grown at an annual average of 7.6% during the last 5 years, while the dividend over the same time has been upped 10.8% a year on average. The figures for the last 10 and 15 years are 4-6% compound annual growth for Mr Sinclair’s salary, versus 8-9% for the dividend. MTVW’s net asset value has also compounded at a rate greater than Mr Sinclair’s wage. Overall, I don’t think shareholders can have too much to gripe about. I would be happy to see dividend and NAV growth outpace Mr Sinclair’s wages in the future. For perspective, the last 5, 10 and 15 years have on average seen properties sold at about 265% of their cost value — and my valuation sums in the above Blog post used 260%. 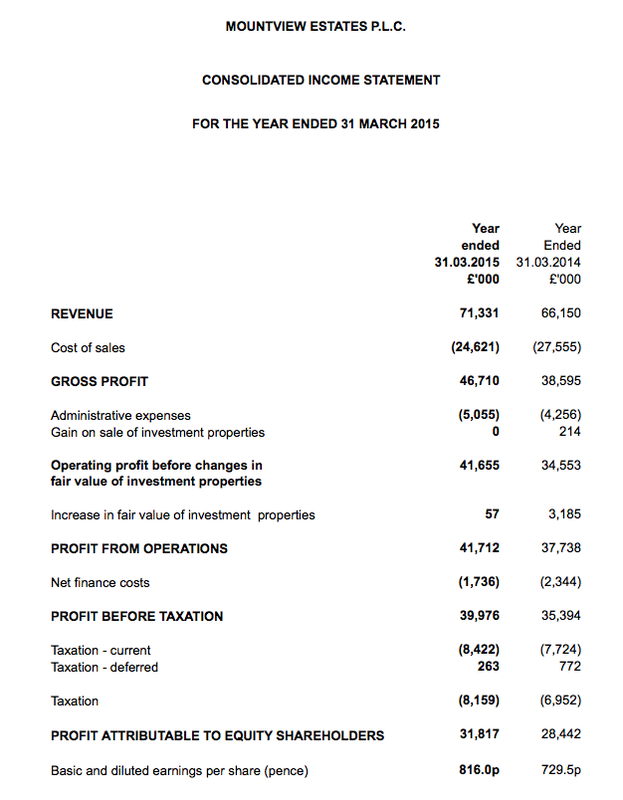 The balance sheet continues to carry properties at the lower of cost or net realisable value. The £666m revaluation figure is based on existing leases and tenancies — that is, before any uplift to the market value of the property as and when the regulated tenancy ends. I was just browsing through your two posts on MTVW and noticed that there was a very material uplift in your NAV guess from the first article (“Why I’m Up 70% in 3 Years”), where you guess a NAV of £103 per share, to this article, where you calculate £180 per share. “My latest sums indicate the balance sheet could be worth £103 a share based on those interim accounts. Using the 2013 Interim figures, £328m trading properties x 2.6 times uplift = £853m, minus 20% tax on (£853m – £328m) = £105m, plus investment properties of £26m, minus debt of £99m gives a potential NAV of £675m, or £173 per share, using the first of the two methods in this post, the most recent article. Obviously we have had the big independent valuation since your original post, however you don’t use this revaluation in your working. I was wondering if I was missing an assumption here in how you have come to your figures? If the original NAV guess should have closer to £173 per share in your original article it shows with hindsight what a steal they were at that point when they were £70 to buy! I must admit I made a mistake in my initial spreadsheet that I discovered only in 2014 (and long after my first purchase)! I multiplied the trading-property stock by 1.6x rather than 2.6x. If I had not made that mistake at the time of my original purchase at c£40, then I may have put a lot more into the shares. Oh well. At least even with the mistake I had a margin of safety. I always need an MOS just in case my sums are wrong! Anyway, good spot. Well done.